Science and health are not taught in the Old Colony schools in Latin America, thus people learn about health related issues from their parents and peers. 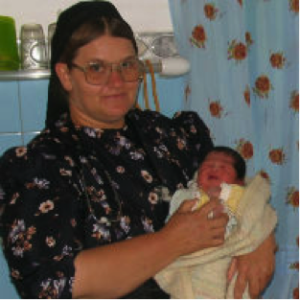 The Low German Mennonite culture is predominantly oral; books and magazines are not readily available in village communities. Learning about health related issues usually occurs through experience. Practitioners in Ontario rely heavily upon print/pictorial material to educate individuals about health issues. Relying on these resources to educate Low German populations is usually ineffective because the population often does not have the necessary literacy skills to understand health related content. Additionally, many of the pictures may be culturally inappropriate. It is important to engage in alternative forms of education in order to increase the ability of the Low German people to follow through on necessary health plans. 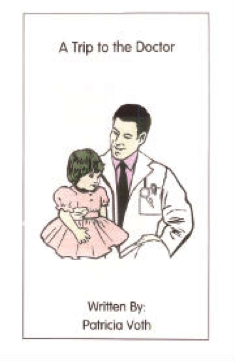 The booklet A Trip to the Doctor may be a helpful resource as you support families preparing for doctor’s visits. See Resources for teachers. See Resources for teachers. Medical diagnoses and family medical histories are often unknown within Low German families, especially if the issues involve the reproductive system. It is common for adult children not to know the cause of death for their parents or grandparents. Some adults are hesitant to share their medical status with even their closest family members. At the same time, stories of extreme events such as losing a limb, major treatment interventions and invasive procedures will often be repeated with regularity, even in the presence of children. The use of home remedies is common. 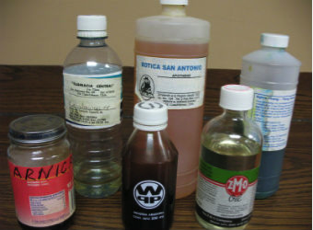 The use of home remedies for common symptoms such as headaches, fevers, infant colic, skin abrasions, abdominal discomfort and injured limbs is a common practice in Latin America. This practice continues in Southwestern Ontario. These inexpensive remedies are carried out by lay practitioners and family members. Positive personal anecdotal reports are usually the key factor in the continued use of these products. These products may or may not be in the original labelled containers. Prescription medications are readily available from pharmacies and lay community health practitioners even without prescriptions. Pain and anti-anxiety medication, antibiotics and diuretics are often purchased by Low German people on the recommendation of family members. There is strong support for using medicinal products to reduce or alleviate undesired symptoms. A clean home is a highly valued sign of being a good mother and house wife. The women have daily and weekly house cleaning routines (washing dishes after each meal, washing floors,) as well as spring, fall, and special holiday house cleaning activities (washing walls and ceilings 2-3 times per year). Within the Low German colonies in Latin America, immunizing children for communicable diseases has become a more readily accepted practice in the last decade. However, upon arrival in Ontario, there may be gaps in their immunizations, especially if they have relocated several times. One pattern frequently noted by Ontario health care professionals is that children from Latin America have often received a greater number of vaccines for polio than is recommended in Canada. Adults who received vaccinations in Latin America as children may be missing their TB booster. Medical checkups/physicals are not routinely practised and preventative practices such as breast exams, pap tests, TSE or prostrate exams are unknown. Therefore, these procedures need to be explained and taught before they will be practised. 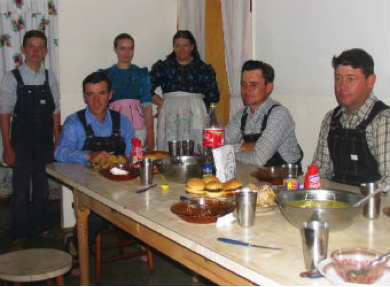 Low German Mennonites from Latin America are generally very modest and often feel very uncomfortable when they need to reveal specific body parts. This is reflected in the fact that the Low German language has few biological terms and people often know only the slang terms for body parts or functions. Low German families value nourishing meals and eating together as a family. Providing substantial meals that are made from basic ingredients (flour, eggs, milk, potatoes and meat) is very important to the identity of being a good mother and wife. However, understanding the nutritional value of food items is minimal. Chips are equated with potatoes and soft drinks are equated with water; this demonstrates a lack of understanding about the effects of processed foods (high fat/sugar and low nutrient value). Sexuality is a very private matter and the maturation of boys and girls is not discussed in family or church settings. Low German families are often offended when their children receive information on reproduction/sexuality in school or community settings. Discussion of sexual matters in adult groups is considered inappropriate and will create much embarrassment, especially if the practitioner does not have a trusting relationship established with the group members. Concepts such as germ theory are relatively unknown in this population, especially if their education occurred outside of Canada. Though cleanliness is valued, the understanding of what makes something clean or dirty may differ from current Canadian norms. For example, multiple people may use the same bath water and towels or share utensils while eating or drinking. As long as the child is clean (has had a bath) it is common for a child with a contagious illness such as chicken pox to be taken along on family visits. Self-trained midwives and other lay practitioners are common within the Mennonite colony context. Within the colony setting, self-trained midwives, chiropractors, massage therapists, herbalists, dentists and other unlicensed workers are accessed in times of need. The chiropractor or the massage therapist is usually the first practitioner to be consulted by Low German newcomers, even in Canada.